This Program has two intakes every year, spring intake and autumn intake. A total of 3,541 graduates of our school graduate in 2012. There are more than 100 graduates get the job in National Key Hospital, like Beijing Shijingshan Hospital, The people's liberation army 306 hospital, chaoyang hospital etc. With the extensive development of exchange and collaboration programs with other universities and institutions at home and abroad, DMU has established collaborative relationships with 75 universities and 38 research institutions in 27 countries and regions, including The State University of New York (America), Curtin University of Technology (Australia), State Medical University of VolgaDnepr (Ukraine) etc. Both of the two direct affiliated hospitals have been authorized to be the first-rank hospital. As the biggest comprehensive teaching hospital and emergency center in the south of Liaoning Province, the First Affiliated Hospital has won the honor of "National Top 100". With the development of medical services, in 2003, the Second Affiliated Hospital successfully annexed China Petrochemical Industry Hospital Dalian Branch. Now, these two affiliated hospitals have gone into the leadership in China in the fields of multi-slice spiral CT (MSCT) coronary angiography, catheter ablation treatment for atrial fibrillation, integrated traditional Chinese and western medicine in acute abdominal diseases, etc. Moreover, interventional thrombolysis treatment for cerebrovascular diseases and the transplant operation have also achieved domestic advanced level. Currently, there are over 4,400 faculty and staff, doctors and nurses in the university, among whom more than 500 are professors and about 510 are associate professors, including over 500 Ph.D. and M.S. supervisors. At present, there are 1 national key discipline, 1 provincial key discipline on the first-level, 15 on the second-level, 3 post-doctoral mobile station, 1 first-level discipline doctor program, 12 second-level discipline doctor programs, 5 first-level discipline master program and 50 second-level discipline master programs. Meanwhile, there is 1 ministerial research institution, and 1 ministerial lab, 5 provincial key labs, and 6 key labs for provincial universities. In addition, DMU possesses 12 bachelor-degree programs. 4.Have attained Master Degree with good marks. 5.Have solid financial support to afford the study and living expense in China. Two recent passport-sized photos of the applicant. Transcript should be in Chinese or English. If not, it should be translated into Chinese or English and be notarized. 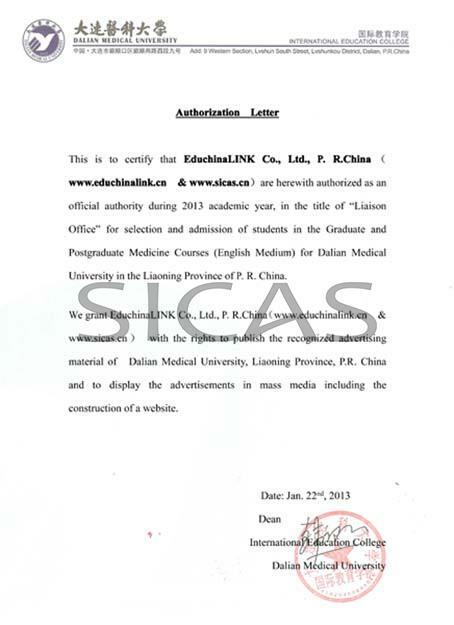 Photocopy of Foreigner Physical Examination Record. Click here to download. Normally the balance is enough for your first year tuition fee and accommodation fee. *Note: Although the course is taught in English, all students are expected to meet HSK 4 (Chinese Language Test) as the minimal requirement for graduation.